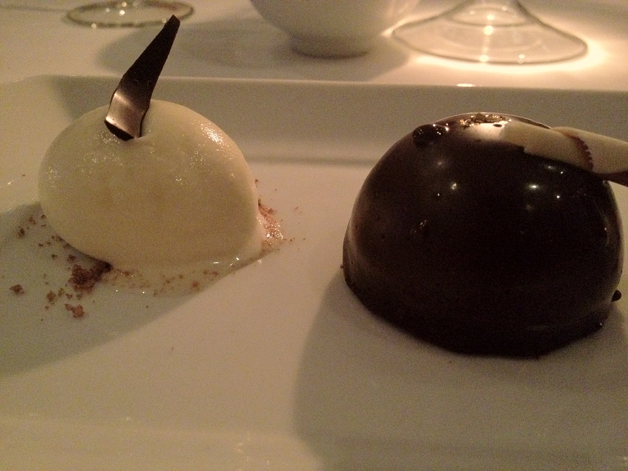 Patterson’s review – middling Mayfair mediocrity? Update: this restaurant has now closed. Bo London now occupies the same premises. It’s tempting to think that because a restaurant has been well-established and operating for several years, then it must be doing something right and has struck upon a winning formula. The pessimistic view is that they’re merely cruising along on past glories and are past their prime. Patterson’s has been serving up Modern European cuisine in Mayfair for what seems like donkey years. The Euro Hedgie and I popped along one weekday evening and we were both immediately struck by the Eighties-vibe of the place due to the stark white walls and the colourful fish tank (as well as one fish tank which was all but empty apart from one lonely lobster). Both the Hedgie and I opted for the tasting menu. Amuse bouche should be inventive palate-ticklers which is not a description that can be applied to leek and potato soup. 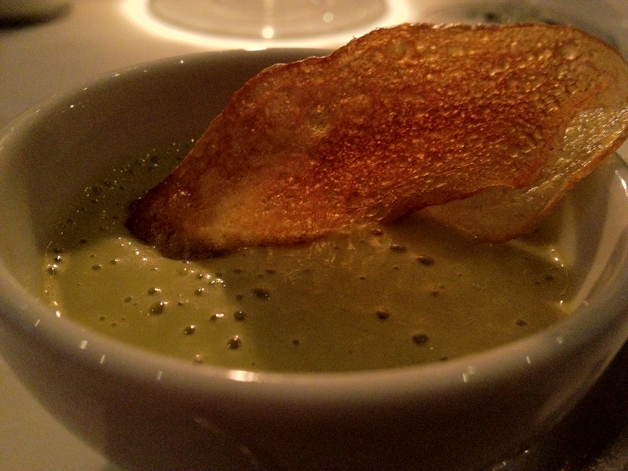 The smooth and creamy soup tasted more of leeks than potatoes with the potato part provided by what were essentially crisps. 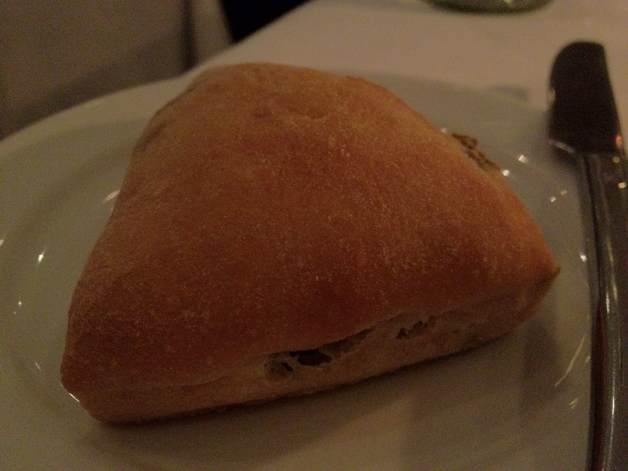 One good way to liven up this pedestrian amuse bouche is to dunk in some of the mildly salty olive bread. This bread knows which side it’s buttered on. The fresh and crisp, well-grilled red mullet was paired with some equally fresh and salty anchovies. This simple pairing of fresh seafood is best enjoyed without the ill-judged accompaniments of grapefruit and green, unripe mango which add little to the dish. Mullets: bad hair, good fish. 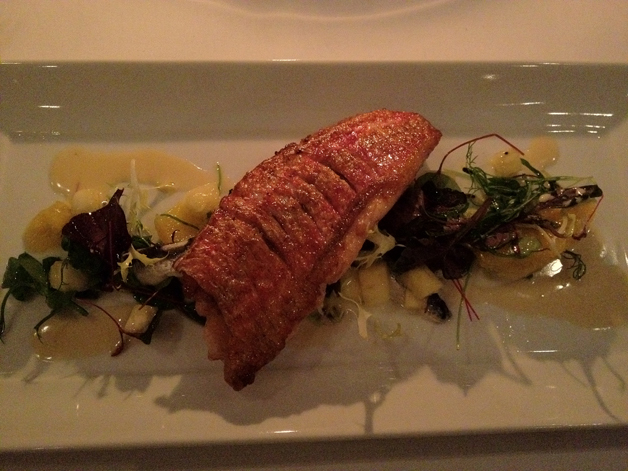 Sadly, the sea bass, that omnipresent staple of Modern European restaurants, was a let down. The fish was dry, overcooked and flat with all the fat cooked out of the flesh. 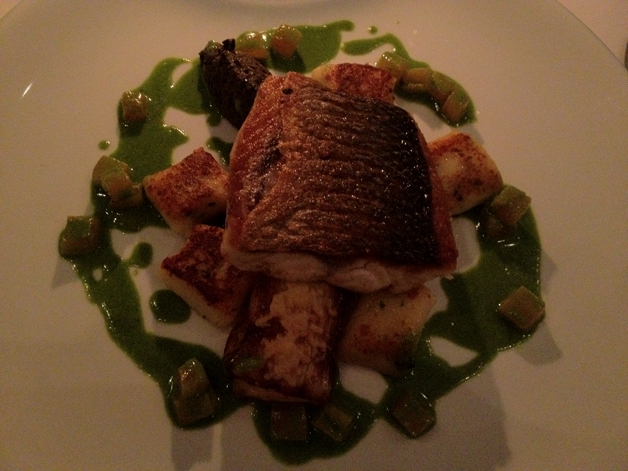 The ordinary green leaves, leeks and gnocchi did little to redeem the woefully misjudged fish. Our seafood-dominated meal continued with a courgette flower stuffed with lobster. 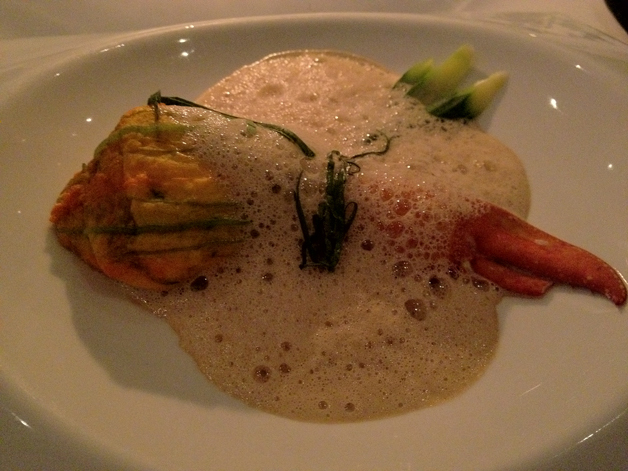 The freshness of the lobster was highlighted well by the simple but the evocatively scented, bold, salty foam. Sadly, the courgette flower just faded into the background which is a shame as courgette flowers can easily be a highlight of a dish as the signature courgette flower dish at The Salt Yard shows. 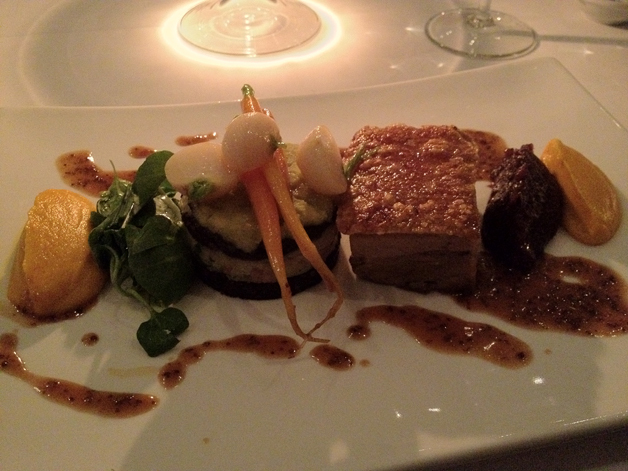 The seafood streak ended with a meaty dish in the form of pork belly, another Modern European staple. The crackling had just the right of crispness – neither too hard and crunchy, nor too soft. While the meat itself wasn’t too salty, it was also severely lacking in moist fattiness which is a crucial part of what makes eating pork belly so sinfully delightful. A small amount of redemption came in the form of the accompanying tangy onion relish and the interesting layered cake of potato and black pudding. Despite the latter, the savoury patty wasn’t too salty and it was topped with shallots and sweet, tender baby carrots. Pig out? I’d rather not. 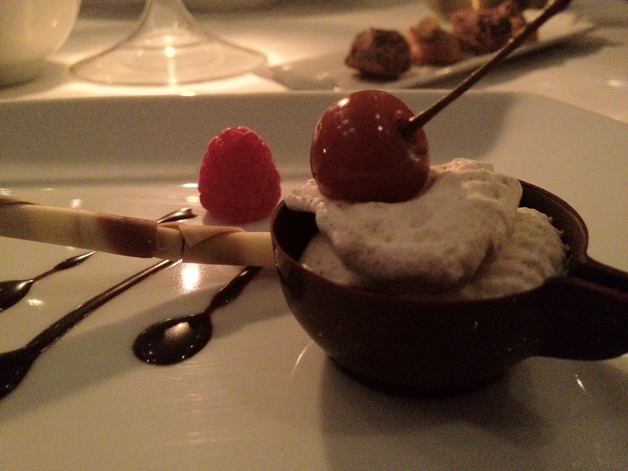 Despite its elaborate, three-part appearance, I struggle to find anything interesting to say about the bland chocolate mousse and its accompanying fruit-topped madeleines and ice cream. Somethings really are black and white. 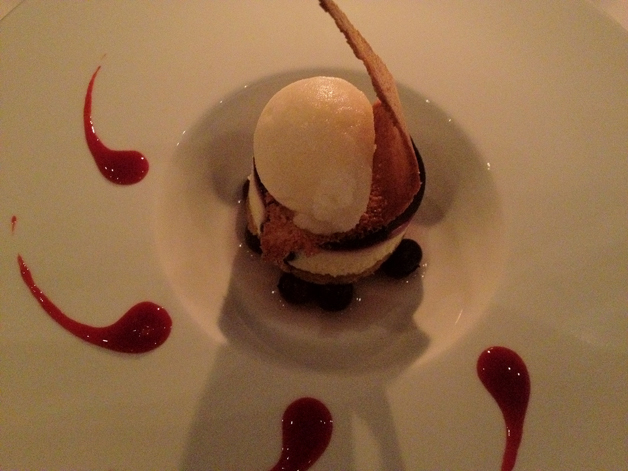 The pastry base of the blueberry and brillat saverin cheesecake was also forgettable. The blueberries weren’t overly sweet, but while the brillat saverin cheese layer was fluffy and airy, it could really have been made from any cheese for all the difference it made. Yawn. 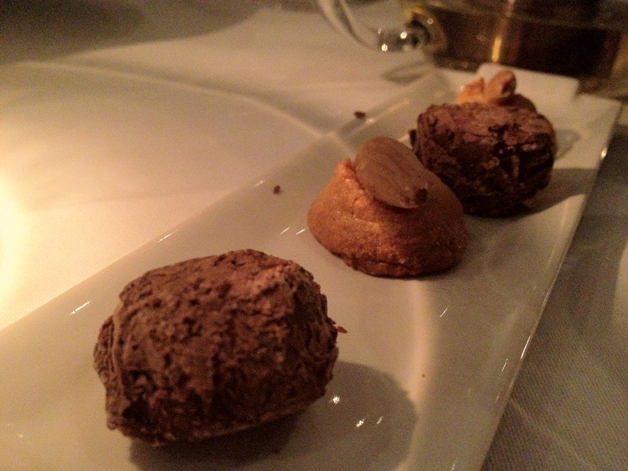 The petit fours were equally unmemorable, with the possible exception of a zesty, ginger infused madeleine. While a few dishes from our dinner at Patterson’s were either decent or actively bad, most failed to arouse any passions at all and sat squarely in the bland, uninteresting category. It’s the sort of food that might impress visiting provincial in-laws, but otherwise Patterson’s should be far down the list of places to dine at – especially for anyone looking for restaurants serving interesting, well-crafted and delicious Modern European cuisine because Patterson’s isn’t one of them. Opening Hours: Monday-Friday noon-15.00 and 18.00-23.00. Saturday 17.00-23.00. Total cost for one person including free tap water: £47 approx. Tags: bread, cheesecake, chocolate, courgette, flower, ice cream, leek, lobster, london, madeleine, mousse, mullet, olive, patterson's, pork belly, potato, restaurant, review, sea bass, soup. Bookmark the permalink. Previous post ← East Street review – full of Eastern promise or just full of it?